Abdul El-Sayed speaks to students at Harris Hall. El-Sayed said his faith taught him to seek justice. No matter how unpopular they may be, former Michigan gubernatorial candidate Abdul El-Sayed said he doesn’t back down from his beliefs –– and challenged students to be kind even when they face opposition. 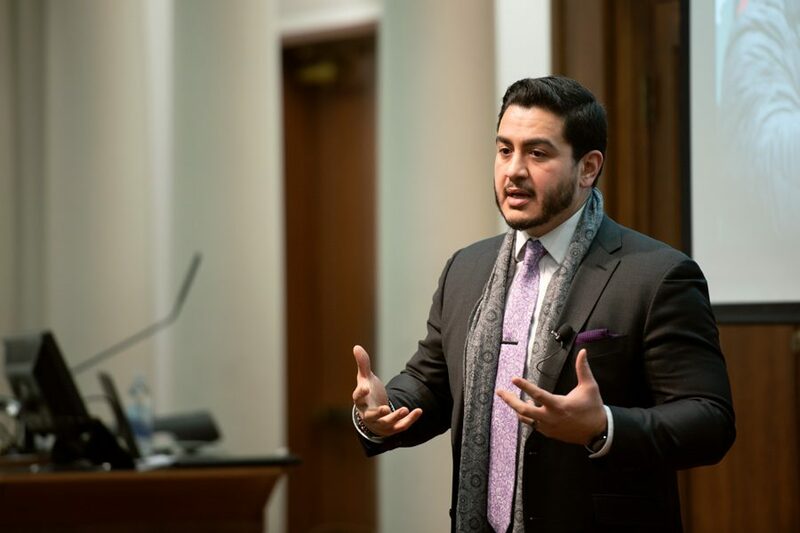 Speaking to about 50 students at Harris Hall on Thursday, El-Sayed recalled his own experiences running for governor and discussed the importance of maintaining strong values. As the keynote speaker for the Muslim Cultural Students Association’s Discover Islam Week, which this year focused on the intersection of Islam and civil engagement, he said his faith taught him be good and seek justice. Weinberg sophomore Jihad Esmail, who helped coordinate the event for McSA, said El-Sayed reflected the changing atmosphere in politics, especially following the election of the first two Muslim congresswomen. El-Sayed said he had decided to run for Michigan governor following the election of President Donald Trump in 2016 because he wanted to help others. This same desire had pushed him in the past to become a doctor, then Michigan’s health commissioner. Weinberg first-year Fizzah Jaffer, who is a pre-med student, said she closely identified with El-Sayed’s attitude of wanting to serve people through medicine. Although he was wary of how the public would react to his Muslim identity, he decided to take action anyway. El-Sayed said his 18 months on the road ultimately taught him that while politics might be ugly, people are good. As he met people all over the state –– in pubs and in living rooms –– he said the discussions he had with people inspired him. This, however, does not mean he did not meet pushback. Yet, no matter how much he disagrees with a person, he said he is respectful in his response because he believes all people are equal and deserve empathetic approaches. This is why he disagrees with “callout culture” and “canceling culture,” which he said fail to respond to others in kind and respectful manners. “Sometimes we’ve forgotten that just because we believe ourselves to be right doesn’t justify, at all, taking away the shred of dignity from somebody else,” he said.